I love the rug but it is a bit thinner than what I’ve had in the past. The ends of the rug won’t stay down without weight on them. But it is worth the price you pay. Add sophistication to your room with this elegant Serra rug from Porch & Den. Made from polypropylene, the contemporary style rug features an abstract marbled pattern. 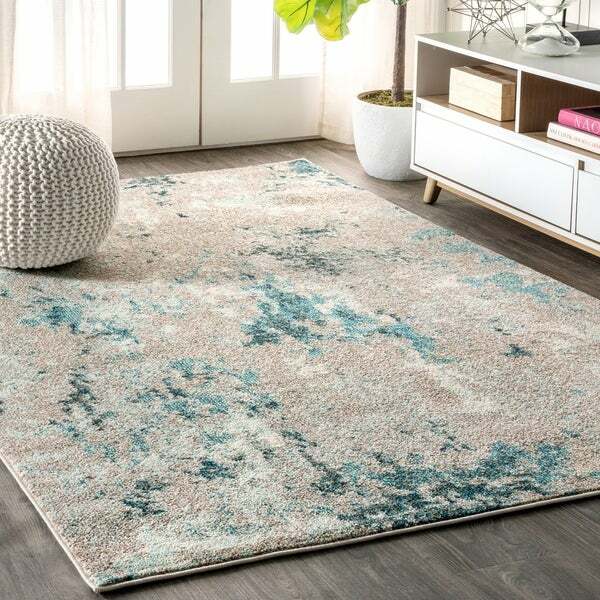 The sophisticated , power-loomed rug has aqua, turquoise, cream, and grey colors and high traffic durability for ideal use in your decor. Please Note: Due to differences in monitors, some rug Colors may vary slightly. Lengths and widths may vary from the published Dimensions. Patterns may vary slightly according to Shape and size selected. All rug sizes are approximate. Due to the difference of monitor Colors, some rug Colors may vary slightly. We try to represent all rug Colors accurately. Please refer to the text above for a description of the Colors shown in the photo. Dimensions 120.0 In. X 93.0 In. X 0.35 In. Whether you're rearranging a room for guests or for good, you might notice some trouble in your area rugs. Luckily, dents, wrinkles, and bumps are minor nuisances that can easily be fixed. With just a little work, your rugs can look brand new. If vacuuming repeatedly won't cut it, try these tricks to get your rug to lay flat. If you’ve ever stepped out of bed just long enough to realize that the floor might as well be a polar ice sheet, then you understand why a bedroom area rug is more than just a good idea. Not only do bedroom area rugs save your chilly toes, but they also flaunt your unique style and personality. You can use a rug to hide annoying carpet stains, buffer noise, and protect your solid floors from being scratched by a weighty bed frame. Use these tips to choose a bedroom rug that pulls your decor elements together and cozies up your personal space. Hallways see about as much traffic as LA highways. Fortunately, there are rugs that are designed specifically to protect your carpet or flooring from getting road rash. Hallway runners are long, rectangular rugs that you can place in any areas with a lot of traffic. Not only do runners protect your flooring from wear and tear, but they can also make a huge design impact on a narrow space. To find a welcoming, dirt-resistant rug that can handle life in the fast lane, keep these hallway runner tips in mind. When you’re dreaming of longer days and warmer temperatures, capture all of your optimism and excitement for the summer season in a vibrant outdoor rug. The best outdoor rugs create flow between your spaces and soften the hardy surfaces of your home’s exterior. Use these helpful tips to get the most from your outdoor area rugs, no matter what time of year it is. Welcome to your one-stop-shop for learning how to decorate a living room. There are a few simple things to keep in mind before taking the plunge. Think about your intended purpose for this space. This will help you decide on the right furniture and decor to keep the room looking cohesive. If your living room is primarily for entertaining guests, you’ll want enough seating and lighting to encourage conversation. However, if you plan on spending a lot of time in this room to watch TV, play games, and read books, consider furniture that allows you to stretch out and relax for an extended period of time. Regardless of how you intend to use your space, there are a few key elements essential to a well-decorated living room. Comfortable seating, tablespace, lighting, and decor combine to create a welcoming place to lounge. It doesn’t take a lot to keep your outdoor rug looking new. Most are made to dry quickly, resist fading, and clean easily, but to get the most out of your outdoor area rug, it doesn't hurt to do some regular maintenance. Here’s how to clean an outdoor rug and keep it looking as fresh as the day you bought it. Is it a functional rug? Or a piece of art? When you’re looking at a gorgeous Oriental rug, it can be hard to decide. These rugs have the versatility to fit any room in your house and their timeless style matches any interior decor. And yes, that includes yours. Curious how to make an Oriental rug dazzle in your home? We’ll show you how. Keep reading for a little decorating inspiration that will make you want an Oriental rug. Two rugs caught your eye? Get them both! Layering rugs is a trendy technique that will add visual interest to any space. You can blend colors and textures for a unique design all your own. A Persian rug adds elegance and class to any room in your home, with heirloom quality you can depend on. One day, your great-granddaughter will be thrilled to inherit the Persian rug that once graced the living room she played in as a toddler. Let us help you find the perfect one that you and your family will treasure with these rug-buying tips. Forget trying to mimic the generic living room styles in decorating magazines and showrooms. Your home needs a unique quality that stands out from the cookie-cutter decor of your neighbors. A one-of-a-kind Moroccan rug will erase any need to “keep up with the Joneses,” setting your home design apart in a bold and beautiful way. With a range of designs from ordered geometric to free form, there’s sure to be a Moroccan rug that matches your decor style and taste. Keep reading to see how you can decorate with Moroccan rugs for a look that’s both comfortable and stylish. The glitter and glamour of gold is catching the eye as a 2015 home decor trend. If you want to refresh your home this spring, new pendants and lamps help create a chic, brightening effect.